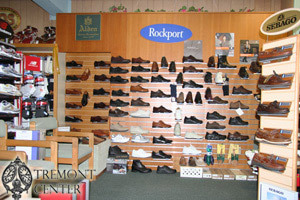 We carry many brands of shoes ranging in sizes and widths. Click a logo to visit the brand's website. You'll notice, when you view some of our vendors' sites, they may try to sell directly to you. The advantage of purchasing from your local store is that we will take care of all shipping costs and any issues that might occur. Plus you get to see and try on the product. We thank you for shopping with us! We also carry shoe care/maintenance products, handbags, wallets, inserts, and socks.